Is the sun the only enemy of your outdoor decking? The truth is that the sun can take away the initial glamour of even the gorgeous ipe outdoor decking. UV radiation ruins the lignin found on such natural materials and this causes wood fibers to loosen up. As a result, decks lose their initial good looks. 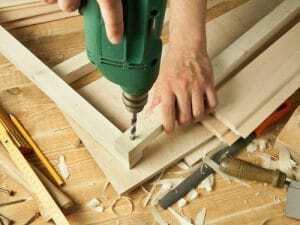 But natural wood is also susceptible to moisture and not always resistant to termites. When you finish your deck properly, you actually make it stronger and thus prolong both its beauty and lifespan. Wood materials are different. Some need sealing and some staining. Some need oil-based and some water-based solutions. So, it’s better to always consult with your deck contractor to avoid mistakes. Not all finishing products are the same either. Some colored products might protect wood better from the UV rays. Solid stains hide completely the grains and also protect from UV radiation. Decks exposed to moisture must be sealed. In such cases, you might just need a clear sealer. Clear sealers don’t protect from the sun. Eventually, your ipe or cedar custom decks will get a silvery color, which is nice but not the initial color. Don’t forget that your ipe custom decks are as dense as hardwood can get and so most finishes won’t penetrate them. Remember that you don’t want old style film-forming products. Luckily with new technology, water-based solutions are better absorbed by wood. Up until recently, people stopped buying film-forming finishes because they were hard to penetrate and thus hard to refinish. Today, things have changed and you will find better products on the market. All the same, such products will still form a layer of coating over the deck. So, in order to use film finishes, you need to remove the existing one. With non-filming products, you just need to clean and repair your decks and then simply recoat them. Prefer to apply one hand of finish on your deck. Most of these products are not like paint. The pigments won’t stick together and eventually the coating will be peeled off. Even if there is a wooden pergola protecting your deck, it will get dirty over the winter months. So it needs good cleaning. The problem is that some parts are directly exposed to elements whereas some parts are not exposed to elements. 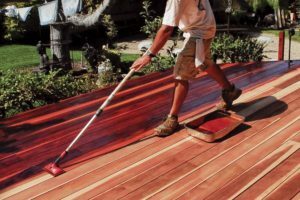 In other words, some parts of your deck will be dirtier than others and show signs of discoloration. You need to give emphasis to these parts and clean them well so that the finishing job will have good aesthetic results. Don’t forget to check for damages which must be repaired before you finish your decks too. 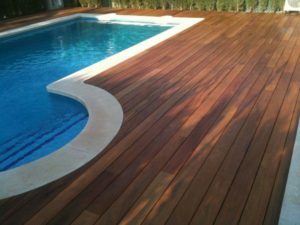 And always ask a deck company about finishing techniques and options based on the condition and wood species of your deck.